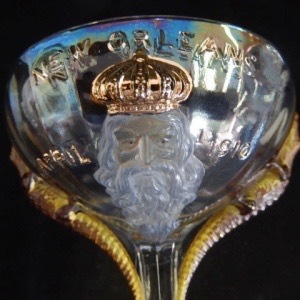 Pattern Description: The stem of this pedestaled champagne has two painted alligators going up opposite sides, with the King Rex (of Mardi Gras) with New Orleans and the date on the bowl. 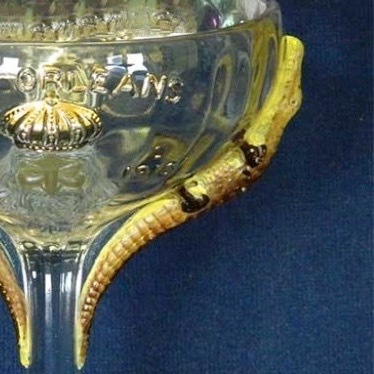 This commissioned commemorative pattern (for the Shriners organization annual convention) has two beautifully painted alligators climbing up the side of the glass. 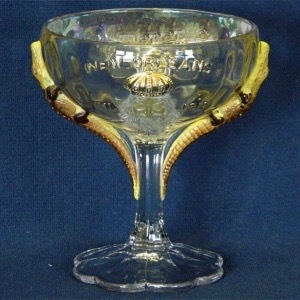 King Neptune is on one side of the champagne bowl. The base is scalloped. 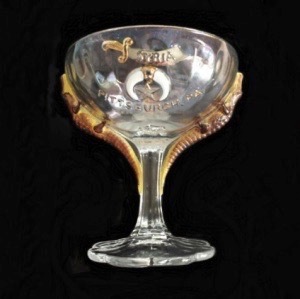 The champagne is about 4 3/4″ tall and 3 3/4″ wide. The detailed pictures are courtesy of C. Katsikas.